I love these great ideas. Here is something I make often and is very popular. A candy tray - molded chocolate in nifty shapes. You can do this for any occasion you can think of. I got some cheap clear plastic plates that are just right. I got the molds at www.sugarcraft.com. They have TONS of chocolate molds! Thanks for showing off your adorable chocolate candy tray. As you say, it's a great idea for any party occasion. 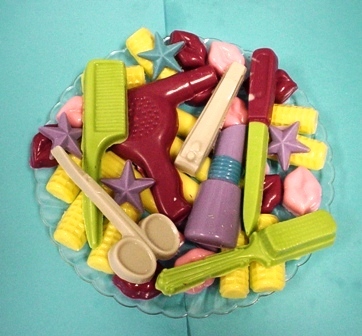 I even like the idea of including the making of the chocolate candy in various molds as part of the party activities. This works great, especially for older children. They love the fun and creativity of it all. Think of it - Looking at your tray of chocolate candy in the photo, it would be perfect for a girl's birthday party or sleepover project activity. Perfect! Another place for a ton of great mold choices is Candyland Crafts. They have a huge selection of molds along with everything else you need too. Thanks again for sharing your molded candy ideas. Add more as you make them. We can never get enough chocolate around here! That looks great! Thanks for posting!